KRUIBEKE, Belgium—In East Flanders, European UCI cyclocross racing continued, with two familiar faces riding back to the top of the podium at the 2017 Poldercross, part of the Brico Cross series. American Katie Compton (KFC Racing p/b Trek, Panache) demonstrated she’s feeling right at home in Europe, taking another Elite Women’s win over Maud Kaptheijns (Crelan Charles) and Ellen van Loy (Telenet Fidea Lions). 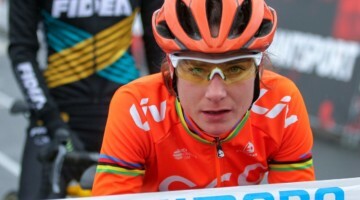 World Champ Sanne Cant (Beobank Corendon) was fourth, over a minute in arrears. 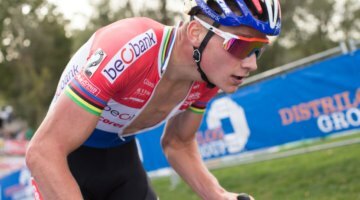 In the Elite Men’s race, it was last year’s dominant duo at the front, with Mathieu van der Poel (Beobank Corendon) escaping the 2017 World Champion Wout van Aert (Crelan Charles). Quinten Hermans followed Van Loy’s lead, securing another Telenet Fidea third place. 2017 Junior World Champion Thomas Pidcock made his Telenet Fidea Lions debut in ninth. The 13-time National Champion wasn’t the only American to contest Poldercross. Two Elite Men and three Junior Men took the start in Kruibeke. Euan Cameron, Jenson Young and Oliver Howson (third at the 2017 Nationals in Hartford), finished 15th, 16th and 18th, respectively. See the full UCI results from the Junior Men, Elite Women and Elite Men below. 1 30 FERDINANDE Anton BEL LARES-DOLTCINI CT 0:43´17.0"
2 5 TULETT Ben GBR BEELINE BICYCLES RT 0:43´17.0"
3 26 VERBURG Luke NED LARES-DOLTCINI CT 0:43´27.0" +10.0"
4 28 VANDEPUTTE Niels BEL IKO-BEOBANK 0:43´27.0" +10.0"
5 7 DEWULF Maxim BEL LARES-DOLTCINI CT 0:43´32.0" +15.0"
6 29 JORDENS Jarno BEL AA-DRINK JONGERENTEAM 0:43´34.0" +17.0"
7 14 VAN DEN EYNDE Vince BEL ACROG - BALEN BC 0:43´41.0" +24.0"
8 21 THYS Joren BEL AA-DRINK JONGERENTEAM 0:43´52.0" +35.0"
9 39 MEULEMANS Lennert BEL IKO-BEOBANK 0:44´04.0" +47.0"
10 10 PEMEN Dolf BEL CYCLING.BE - ALPHAMOTORHOMES C 0:44´07.0" +50.0"
11 8 ELLIS Matthew GBR STEVE POOLE PLANT HIRE 0:44´27.0" +1´10.0"
12 24 VERDONCK Andres BEL VZW WP DE MOLENSPURTERS MEULEB 0:44´42.0" +1´25.0"
13 17 WESTHOFF David GER STEVENS RACING TEAM JUNIOREN 0:44´42.0" +1´25.0"
14 13 VAN DEN PLAS Jasper BEL IKO-BEOBANK 0:44´42.0" +1´25.0"
15 9 CAMERON Euan USA PAUL MILNES / OLDFIELD ERT 0:44´57.0" +1´40.0"
16 15 YOUNG Jenson USA 0:45´18.0" +2´01.0"
17 32 DECOSTER Louis BEL CYCLING.BE - ALPHAMOTORHOMES C 0:45´42.0" +2´25.0"
18 16 HOWSON Oliver USA PH-MAS/PAUL MILNES/ OLDFIELD E 0:45´47.0" +2´30.0"
19 2 VANDEN BUSSCHE Wannes BEL CYCLING.BE - ALPHAMOTORHOMES C 0:45´57.0" +2´40.0"
20 11 DEL GROSSO Bodi NED WV METEOOR ASSEN-RODEN 0:46´27.0" +3´10.0"
21 33 CAS Stijn BEL YOUNG CYCLING TALENT D&D 0:46´32.0" +3´15.0"
22 12 LIPPENS Seppe BEL BIKE EXPERIENCE CYCLING TEAM 0:47´02.0" +3´45.0"
23 36 NOYENS Jarne BEL DE KASTELSE DURVERS V.Z.W. 0:47´17.0" +4´00.0"
24 31 QUETS Stijn BEL DE KASTELSE DURVERS V.Z.W. 0:47´47.0" +4´30.0"
25 6 DE LAET Tomas BEL WIELERCLUB STEEDS VOORAAN V. 0:47´52.0" +4´35.0"
26 27 COCKX Maxime BEL YOUNG CYCLING TALENT D&D 0:47´57.0" +4´40.0"
27 22 DE NIJS Maarten NED RSC DE ZUIDWESTHOEK 0:47´57.0" +4´40.0"
28 3 CLYNHENS Toon BEL AA-DRINK JONGERENTEAM 0:48´07.0" +4´50.0"
29 18 OBERTEICHER Matteo GER SHOP4CROSS-BIORACER ACADEMY 0:49´07.0" +5´50.0"
30 25 VERHEYDE Leander BEL CYCLING VLIJTINGEN 0:49´17.0" +6´00.0"
31 1 LAEVENS Justin BEL MEUBELEN GAVERZICHT-GLASCENTRA 0:49´47.0" +6´30.0"
32 23 VAN CLEEMPUT Bert BEL PAPILLON-RUDYCO-JANATRANS CYCL 0:49´57.0" +6´40.0"
33 20 DE WEERT Robbe BEL WIELERCLUB "ONDER ONS - PARIKE 0:50´07.0" +6´50.0"
1 2 VAN DER POEL Mathieu NED U23 BEOBANK-CORENDON 1:04´46.0"
2 1 VAN AERT Wout BEL EL CRELAN - CHARLES 1:05´08.0" +22.0"
3 20 HERMANS Quinten BEL U23 TELENET FIDEA LIONS 1:05´30.0" +44.0"
4 6 VAN KESSEL Corne NED EL TELENET FIDEA LIONS 1:05´59.0" +1´13.0"
5 5 SWEECK Laurens BEL EL ERA REAL ESTATE - CIRCUS 1:06´03.0" +1´17.0"
6 4 PAUWELS Kevin BEL EL MARLUX - NAPOLEON GAMES CYCLIN 1:06´03.0" +1´17.0"
7 8 MERLIER Tim BEL EL CRELAN - CHARLES 1:06´03.0" +1´17.0"
8 10 BOROS Michael CZE EL PAUWELS SAUZEN - VASTGOEDSERVI 1:06´03.0" +1´17.0"
9 33 PIDCOCK Thomas GBR TELENET FIDEA LIONS 1:06´03.0" +1´17.0"
10 14 SOETE Daan BEL EL TELENET FIDEA LIONS 1:06´13.0" +1´27.0"
11 15 ADAMS Jens BEL EL PAUWELS SAUZEN-VASTGOEDSERVICE 1:07´01.0" +2´15.0"
12 17 GODRIE Stan NED EL CRELAN - CHARLES 1:07´23.0" +2´37.0"
13 7 MEEUSEN Tom BEL EL BEOBANK-CORENDON 1:07´36.0" +2´50.0"
14 18 ADAMS Joeri BEL EL KALAS - H.ESSERS CYCLING TEAM 1:07´43.0" +2´57.0"
15 30 MEISEN Marcel GER EL STEYLAERTS FIRSTBET 1:08´03.0" +3´17.0"
16 9 AERNOUTS Jim BEL EL TELENET FIDEA LIONS 1:08´17.0" +3´31.0"
17 24 HOEYBERGHS Daan BEL EL STEYLAERTS-BETFIRST 1:08´57.0" +4´11.0"
18 22 WALSLEBEN Philipp GER EL BEOBANK COREDON 1:09´28.0" +4´42.0"
19 25 DEGROOTE Jonas BEL U23 TEAM MAHIEU - KONA - VANDERMEE 1:10´03.0" +5´17.0"
20 42 TIELEN Dario BEL EL INDIVIDUEEL 1:10´15.0" +5´29.0"
21 29 DERVEAUX Niels BEL U23 TARTELETTO - ISOREX SUPERANO H 1:10´15.0" +5´29.0"
22 27 ALDERWEIRELD Robin BEL U23 TEAM MAHIEU - KONA - VANDERMEE 1:10´47.0" +6´01.0"